MiRo-E helps pupils to learn, collaborate and tap into their potential to brilliantly problem solve. By creating interactive and socially engaging experiences in the classroom, students learn quickly, enjoy STEM subjects and produce real results. Schools all over the world can use MiRo-E to create the next generation of technology talent by making learning engaging, effective and rewarding for pupils and teachers. Teachers and pupils want coding lessons that are engaging and rewarding. Most importantly they need lessons that produce real results. However, achieving this can be challenge. Here’s why. Learning to program using software alone but without something physical to apply it to, can mean that the learning is abstract. Some of today’s software and educational robots do not stimulate the pupils imagination or encourage lateral thinking. Existing STEM teaching tools may only appeal to a small audience, meaning STEM subjects struggle to attract a wide range of pupils. Current educational robots can be difficult to set up and repair, offer limited customer support or quickly lose their value. 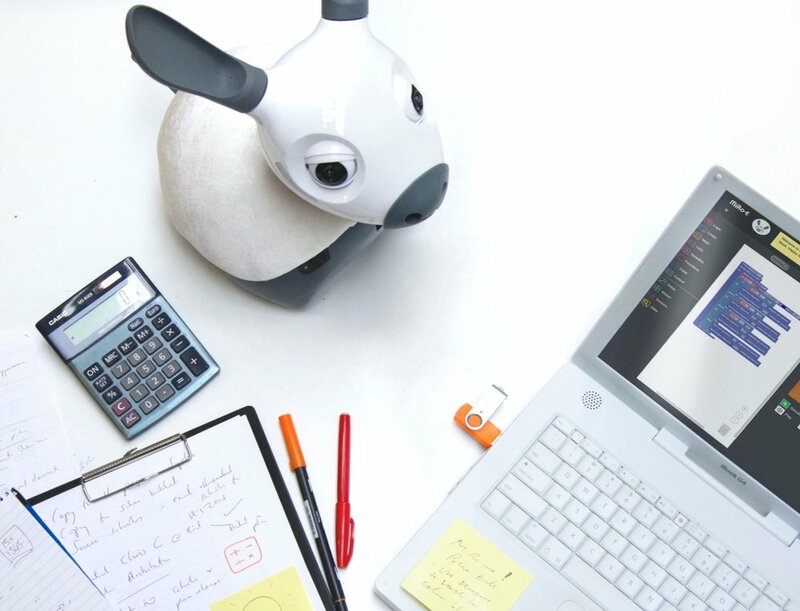 Entertaining and emotionally engaging, MiRo-E is an animal-like companion robot with qualities that are loved by all. MiRo-E can see, hear and interact with its environment providing endless programming opportunities that will push student’s creativity. The results that students create can be related and applied to real world issues. MiRoCode is a user-friendly web-based coding interface, where students can run through lesson plans and experiment with new ideas. They can test code on the simulated MiRo-E and create new skills that can be applied to a real life MiRo-E.
MiRo-E is versatile and accessible for all ages. MiRo-E’s friendly pet-like appearance and qualities stands out and appeals to everyone. Using a MiRo-E can create a diverse and collaborative classroom experience where everyone and anyone can be involved! Follow our lesson plans, create your own or let student’s explore at their own pace. Whatever suits your teaching style. MiRo is already used by Universities all over the world. Starting its life as a developers tool has allowed MiRo to grow and improve. Professors & educators all over the globe have used it as a tool to teach their students about robotics. Relaunching MiRo-E as an educational tool purely for the classroom environment is the next leg of the journey for MiRo, and we can’t wait to see its impact. Want to know more about MiRo-E?